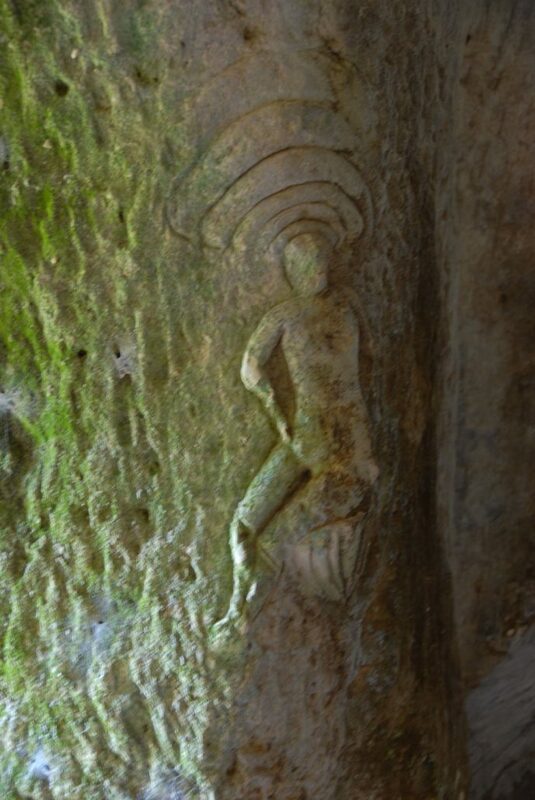 A Venus carved into the rock wall and dated by some from the 5th century, at the time of the fall of the Roman Empire and the great barbarian invasions, is present in one of the caves of the old troglodytic site of the castle of Montastruc. It was venerated until about 1970 at the occasion of the annual celebrations of the Assumption of the Virgin Mary. The parishioners of Lamonzie-Montastruc then came in procession to present in the cave the Virgin of Lamonzie. (fig.6) in a 16th century work (13), which does not seem to have been known to specialists; It illustrates perfectly the worship to the goddess of the underworld, which here takes one child, symbol of life from his breast. There is a worshiping, face against earth, a man in prayer in the position of the orant and others bringing in animals of the underworld (foxes) offering. The underground, depicted many intentionally, do not allow for other interpretations; most of the entries are shown vertical, it should be noted however in the foreground as there are also from horizontal to vertical wells.